This is our weekly look at fantasy adjustments you should make based on venue and/or weather. Entering the weekend action for Week 12 of the NFL season, knowing which players should see an improvement or decline in their projection can be a key to victory. The Thanksgiving holiday weekend is giving us remarkably good weather for us to avoid as we fight through shopping malls and sit on the sofa and watch football. Even with the three Thanksgiving dome games behind us, there just aren’t a lot of concerns. Both Sunday and Monday night games play in the domes in Minneapolis and Houston, which avoids the colder weather November nights bring. That really leaves just a handful of games with cooler temperatures that might affect fantasy production and just one — in Denver — with below-freezing temperatures. Nevertheless, I have projected the impact of both the venue and weather for every fantasy-relevant player in Week 12 for Elite subscribers, and the home/road splits alone can make a marked difference for projected fantasy scoring. Here are the matchups I find most interesting. Andrew Luck (+1.3) has thrown at least three touchdowns in seven straight games. He doesn’t need the help of favorable conditions to produce for fantasy owners. But it’s still nice that he should have them this week. Luck is playing at home in the dome in Indianapolis, and even with his venue-independent success this season, he has scored close to two extra fantasy points at home versus on the road in his career. Meanwhile, the Dolphins have promoted passing touchdowns per attempt by 35%, third-most in football behind only the Raiders and Packers. Another three passing touchdowns seems like a safe bet. My projections offer T.Y. Hilton (+0.6) the biggest boost for the venue and (lack of) weather because of his target volume, but Dolphins’ cornerback Xavien Howard has frequently shadowed his opponents’ top receiver in recent weeks and had tremendous success doing so. Hilton is so clearly the Colts’ most dangerous wideout that I have to assume that will be the Dolphins’ game plan. As such, I recommend you rely more on tight ends Jack Doyle (+0.5) and Eric Ebron (+0.5), in particular in DFS where they are much cheaper than Hilton. Dontrelle Inman (+0.5) is also interesting as a sleeper. Even with Ryan Grant back healthy, Inman drew the start in Week 11 and saw six targets. The Steelers-Broncos game will likely start near 40 degrees Fahrenheit but should fall sharply and end up below freezing before the game is finished. That should be an interesting situation for Steelers quarterback Ben Roethlisberger (-4.0). Coming out of the 2016 season, I would have told you with absolute confidence that he struggles to play in cold weather. That year, he played in three below-freezing games — Week 14 in Buffalo, Week 15 in Cincinnati, and in the Wild Card Round at home against Miami — and he averaged an abysmal 234 yards, one touchdown, and two interceptions. But then he blew that trend up when he threw for 469 yards and five touchdowns against the Jaguars in last year’s Divisional Round. My projections settled on a mild penalty of about half a fantasy point for Roethlisberger for the cold weather. The major reason for Roethlisberger’s week-worst penalty of 4.0 fantasy points is his playing on the road. 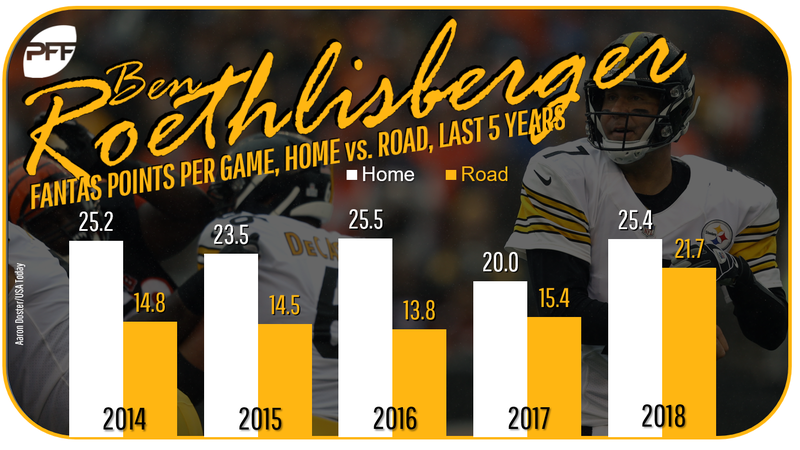 His home/road splits haven’t been as severe as last season when he averaged 5.4 more points in Heinz Field than elsewhere, but he’s still one of the more venue-sensitive players with 3.9 more points per game at home this season. 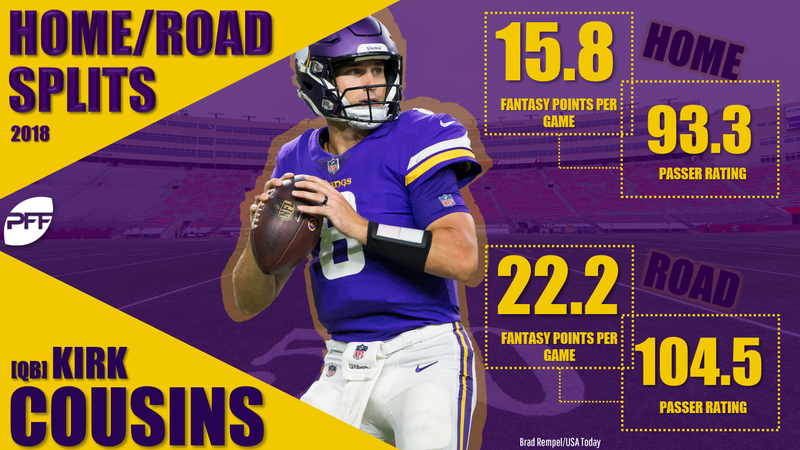 The higher road floor this season means you don’t have to avoid him, but don’t expect a top-five fantasy performance. Ditto for wide receivers Antonio Brown (-2.6) and JuJu Smith-Schuster (-2.3), who suffer when Roethlisberger suffers. In contrast, running back James Conner (-0.5) should be relatively unscathed. The cold temperatures will likely shift some of the Steelers’ play-calling toward the run, and his versatility as a runner and pass catcher insulates him from the severe matchup swings his teammates tend to experience. Relative to their normal production, Broncos running backs Royce Freeman (+0.9) and Phillip Lindsay (+0.5) should enjoy the biggest boosts because of the venue and weather. Home teams are more likely to build leads, which creates the best opportunities for rushing attempts. That said, don’t dismiss receivers Emmanuel Sanders (0.0) and Courtland Sutton (0.0). They counterbalance their weather penalties with opposing venue benefits. Really, you should feel free to start any Broncos you normally would in your fantasy leagues. The Steelers’ defense is pretty favorable across the board, boosting passing yards and touchdowns per attempt and rushing yards and touchdowns per attempt. As mentioned, the Packers boost passing touchdowns more than any team but the Raiders. You didn’t really need that excuse to start Adam Thielen (+0.8) and Stefon Diggs (+0.7), but you have it. They combined to catch 21 balls for 259 yards and three touchdowns in the teams’ Week 2 matchup. Kirk Cousins (+1.4) threw for 425 yards and four touchdowns that day and seems to be a nice matchup play, too. However, it’s interesting to note that he has performed much better on the road than at home this year. He has yet to throw three touchdowns in a game in Minneapolis. I suspect that trend has a lot to do with Cousins’ opponents in his home and road starts, passer-friendly Packers included. But if he can’t light it up this week, I’ll officially start to wonder. Even if Cousins has yet to become Minneapolis’ favorite son, Aaron Rodgers (-1.1) can’t stake a claim, either. He’s played two games in U.S. Bank Stadium since it opened in 2016. He threw for just 213 yards and one touchdown in his first in Week 2 of 2016, and he broke his collarbone after just four passes in Week 6 last year. I can’t imagine how Sunday could go any worse, especially since the Vikings’ pass defense has crept back toward neutral from their early-season 50% passing touchdowns per attempt penalty. But this still projects to be a bad matchup for him and his primary target, Davante Adams (-0.6). I would have said the same about running back Aaron Jones (-0.2), especially if gamescript forces Rodgers to air it out. But after Jones caught five passes for 63 yards and looked explosive in the open field last week, I’m starting to view him as a matchup-proof every-down back like Conner. Don’t overthink things. Jones belongs in your lineups.